Courtesy photo The Lakemont Lions Club participated in the recent Kid’s Day at the Logan Valley Mall by providing vision screenings. Along with the event, the club registered those who were screened for a drawing to win a bicycle. 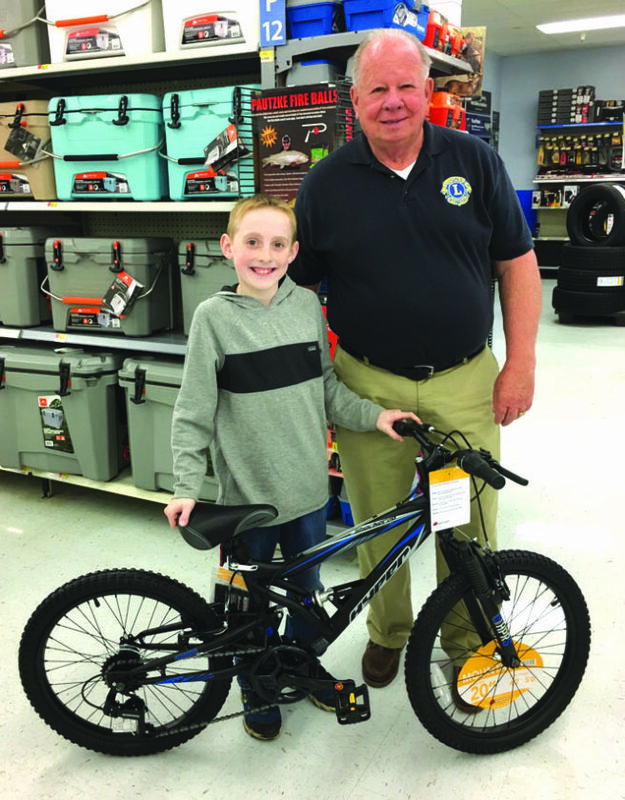 The winner this year was Brycen Hursh shown receiving his bike with event chairman Lion Doug Meintel. The Lakemont Lions are interested in providing vision screenings for children and adults in the area. If your organization has an opportunity for vision screenings, call Meintel at 932-4545. Lakemont Lions are a part of 1.4 million Lions worldwide providing service to those in need. The Horseshoe Seniors will hold a dinner-dance on Thursday at the Bavarian Hall, 112 S. 13th St., Altoona. Dinner is at 5:30 p.m., followed by three hours of dancing to a DJ. Admission is $10 per person. Singles and couples are welcome. This is a fun evening for seniors, and the group encourages new people to come out and enjoy a time of friendship, fellowship and companionship with others. This dinner-dance is a monthly event usually held the third Thursday of every month. Reservations must be made by the Monday before each event. For reservations and more information, call Don Beatty at 946-1074. DUNCANSVILLE — The Duncansville Veterans of Foreign Wars Auxiliary Post 8724 will hold election of officers at 7 p.m. Wednesday at the post. HOLLIDAYSBURG — The Blair County Genealogical Society will meet at 7 p.m. Thursday at the Roller Hojeth Memorial Library, 431 Scotch Valley Road. David Finoli will speak on “The History of Baseball in Western Pennsylvania,” including the Altoona Mountain Cities, Altoona’s lone major league team, and the minor league teams that represented Altoona, as well. Finoli is an author and sports historian who has written 25 books, mostly dealing with the history of sports in Western Pennsylvania. He is a graduate of Duquesne University in Pittsburgh, where he received a bachelor of arts degree in 1983. The Juniata Veterans of Foreign Wars Post 8685 Auxiliary will hold its annual cancer benefit on Saturday at the post. The buffet begins at 6 p.m., with music by Rok Kandy from 9 p.m. to midnight. Donations of door prizes and Chinese auction baskets are still being accepted. Tickets are $8 and must be purchased in advance by calling the VFW at 942-1347. The auxiliary meets at 6 p.m. on the second Wednesday of each month. The Blair County War Veterans Council Memorial Day Parade will be held on May 28. The parade will form at Eighth Avenue and 17th Street, Altoona. Units will assemble at 9:15 a.m. and will move out at 10 a.m.
April 4 — Cheryl Wherry and Carol Moyer, first; Summer Rifkah and Thana Moussa, second; Larry Gourley and Jeff Gourley, third; Hoe Sheehan and Helen Gorsuch and Ted Shade and Phyllis Robbins, tied for fourth. April 5 — Hope Sheehan and Cheryl Wherry, first; Bea Stevens and Mary Moran, second; Summer Rifkah and John Regan, third; Larry Gourley and Jeff Gourley, fourth. Games are open to the public and are held at the Hollidaysburg American Legion Social Hall at 6 p.m. Wednesdays and 12:30 p.m. Thursdays. .com or call Bruce Baldwin at 695-0182. Area clubs and nonprofit groups can email information and photos to community@altoonamirror.com.